Amy is a proud outreach volunteer and member of our Women’s Council. She’s also the wonderful mother of 3 tremendous kids! Amy first discovered Family Reach when she joined a friend as a guest at Cooking Live!. On our Women’s Council, Amy works with other determined women to continue making a difference and helping to spread the Family Reach mission. And as an Outreach volunteer, she donates her time to even more of our families through hospital visits and has the pleasure of interacting with our cancer-fighters and sharing genuine moments. “When a parent looks at you and says they appreciate being able to talk to a doctor alone for a few minutes or make a phone call or simply close their eyes while [us volunteers] entertain and engage patients, those very small things feel tremendous in the moment,” says Amy. 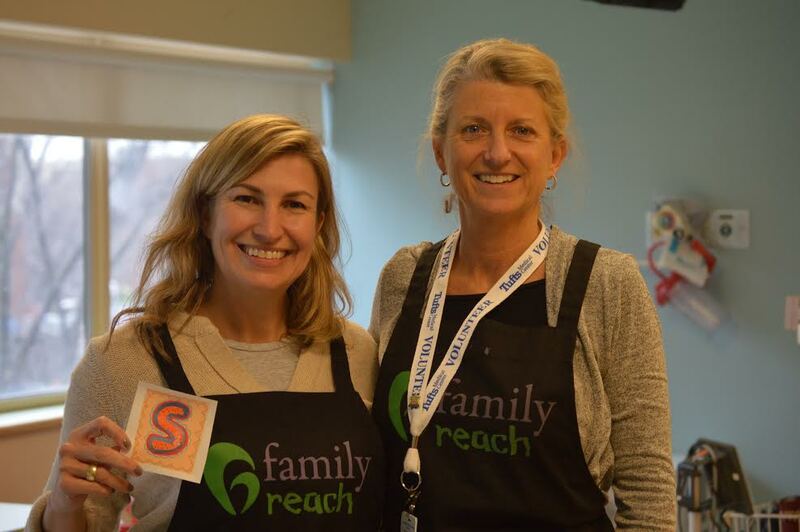 Volunteers like Amy allow us to more comprehensively serve and connect with the families in our community. Through donated time and genuine volunteer-patient connections, our mission reaches families in a unique, lasting way. Nicole Ackerman, our Family Relations Manager, has seen many times the impact Amy has had on our families. Amy’s selflessness and courageous heart shine through in everything she does. We are truly grateful to have you as part of our close community! Do you want to get involved on a deeper level? Click here!